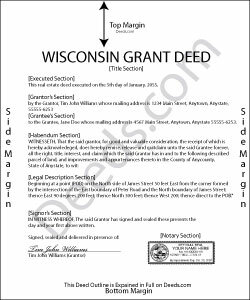 Title to real property in Wisconsin can be transferred with a grant deed. Wisconsin conveyancing forms are not codified. Every conveyance in Wisconsin will pass all the estate or interest of the grantor, unless a different intention is expressed directly or by implication in the deed (706.10(3)). No warranty or covenant is implied in any conveyance in Wisconsin, whether or not such conveyance contains special warranties or covenants (706.10(6)). In a grant deed, the grantor warrants that he has not previously conveyed the property to anyone other than the grantee and that he has not encumbered the property. Further, a grant deed will convey the grantor's after-acquired title, unless limited by specific words contained in the deed. The grantor in a grant deed is required to sign the deed and have his or her signature acknowledge or otherwise authenticated according to the laws of the state. Any of the officers listed in 706.06 can authenticate an instrument in Wisconsin. Notarial acts can be performed in Wisconsin or in another state. In either case, a notarial act must be certified by a certificate of acknowledgment (706.07). Acknowledgments taken in Wisconsin can be taken before a notary public; a judge, clerk, or deputy clerk of a court of record; a court commissioner; a register of deeds or deputy register of deeds; a municipal judge; or a county clerk or deputy county clerk (706.07). In order for a grant deed to impart constructive notice to purchasers of value, it must be recorded and indexed by the register of deeds in the county where the property is located. If the property is in more than one county, the deed must be recorded in each such county. An unrecorded grant deed will be void as against any subsequent purchaser, in good faith and for a valuable consideration, for the same real estate or any portion of the same real estate whose conveyance is recorded first (706.08). This is a race-notice recording act.